Throughout the weekend our media team will be covering the event posting pictures on both Twitter and Facebook. Follow #CheshireHike on Twitter twitter.com/cheshirehike and Like “Cheshire Hike Official” on Facebook for updates throughout the weekend. The annual County Dinner was held on Sunday 7th April where recipients of St Georges Day Awards received their awards. It was also an opportunity to recognise all adults who have received awards throughout the year. 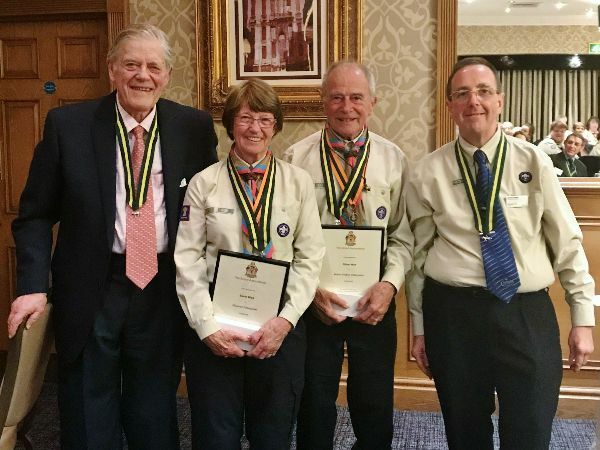 On the night awards were presented by the County President, Sir William Bromley Davenport and the County Commissioner, Graham Phillips. The evening reached a special finale when Maureen & Rob Patheyjohns each received the Silver Wolf. This award is the personal gift of the Chief Scout Bear Grylls and it is very unusual for two family members to receive the award in the same year. Maureen & Rob received their awards in recognition of their amazing support and service in Warrington West. This year 12 Cheshire Scouts will be at Windsor as part of the National celebration. They will parade into the quadrangle in the grounds of Windsor Castle with their proud families watching on. They will also be joined by the adults from Cheshire recognised in the St Georges Day Awards list. This year, the Queen’s Scout Working Party (QSWP) is celebrating its 75th anniversary, and they would like to invite all current and former members to join at a celebration event taking place at Gilwell Park on Saturday 5th October. The event will include a drinks reception, an evening meal, and entertainment. For more information and to register to attend the event, please click here. The next adult support event for Leaders will focus on how Scouting can help to give young carers a bit of their childhood back. In Cheshire there are estimated to be 37,000 children aged 6-18 who care for a parent or sibling and around 11,000 of these children are providing “high levels” of care. In Scouting in Cheshire there are potentially 2,500 young carers, many hidden from view, just privately struggling along. The positive impact Cheshire Scouting can have on these children is almost incalculable. This event will be led by Sarah-Jane Dickinson the education officer with Cheshire Young Carers. She will take you on a journey explaining how you can identify young carers in your group, how to start the conversation with a child and family to explain how Scouting can help them and the simple things you, as a Leader, can do that will revolution the childhood of a young carer involved in Scouting. It’s all very simple, costs little or nothing to do but the impact is huge. Sarah will also show you a short film showing the life of a typical young carer that was specially commissioned for the charity. It will be held at The Heath conference Centre, Runcorn on Wed 1 May starting at 7pm. The 2019 Cheshire shooting squad competed at the Scouts Inter-County Shooting Competition last month at The West Midland Regional Shooting Centre in Aldersley, Wolverhampton. 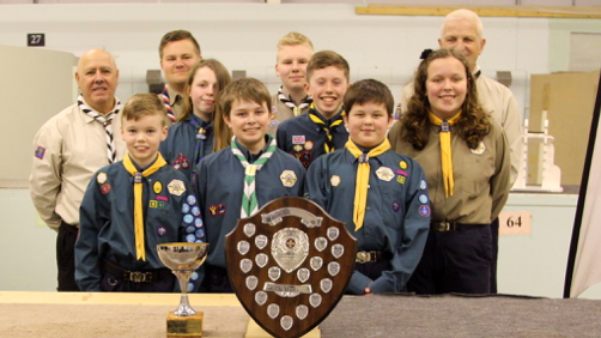 The event had ten teams representing Scout counties including Greater Manchester, London and Devon. At the presentation we achieved best in the pistol trophy (after missing out last year), best rifle team and best overall team for the seventh year! Come along and have some fun enhancing your practical skills as a Leader which will aid you in delivering even better programmes for your Beavers, Cubs, Scouts and Explorer Scouts. This is an ideal training day for new leaders of every section and Module 18 will be validated on the day. It is also a way of completing some of your on-going learning (15 hours over 3 years). You will have the opportunity to attend 7 sessions from all the skills bases on offer. You are receiving this email because of your role at the Scouts. This email has been sent to all members of Cheshire Scouts. This email has been sent to: those who opted in to Communications. If you would like to change your communications preferences you can do this in Compass.